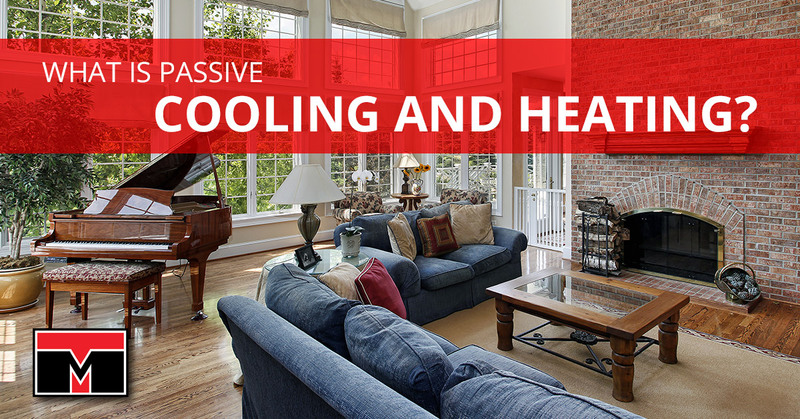 What is Passive Cooling and Heating? Making your home more energy efficient isn’t just good for the environment; it will also save you money in the long run with lower energy bills. One factor that can get ignored when making the move to energy efficiency is the impact of passive cooling and heating. But what is it exactly? Essentially, passive cooling and heating is non-mechanical temperature control. This is opposed to what is called active cooling and heating, which is mechanically controlled. Even with that short description, you can see why passive cooling and heating would reduce energy bills — there is no reliance on electricity to accomplish its goals. Of course, there will be days where active cooling and heating are required, but improving the passive temperature control of your home will make a huge difference. Passive cooling and heating is the strategic use of windows to let the sun in, shade provided by trees, and proper ventilation and insulation, just to name a few factors that help. Not only will it reduce your energy usage, it will also improve the curb appeal of your home while reducing the amount of strain your HVAC system is placed under over long periods of time. You may be surprised to learn the V in HVAC stands for ventilation, and it’s hugely important for improving indoor air quality, energy efficiency, and making the home altogether more comfortable to be in. If your home consistently feels stuffy, you may want to talk with an HVAC professional to discuss improvements to your ventilation or insulation. Natural ventilation is the term for how you can manage the air and breezes that pass through your home, creating a ‘chimney effect’. This effect occurs when air comes in through windows on the first floor, which then absorbs heat from within the house, rises and exits through windows on the second floor. An open-air design for a home is where this effect works best. The bulk of passive heat in your home comes through your windows. Shade created by blinds, trees, awnings, or solar window film can reduce the amount of heat produced in your home. A body of water like a pool, lake, or pond can cool the air before it reaches your home. A well-placed water feature can help create cool air if there are no naturally occurring bodies of water near you. Air leaks will bring in hot or cold air depending on the season and will make it harder to control the temperature of your home. Additionally, poor insulation will let the air you do want in your home out, increasing the use of active heating or cooling to maintain temperature. Proper insulation in your roof, walls, floors, and foundation will improve its thermal resistance. Insulation is a fantastic way to save on energy costs. However, it’s important you don’t add too much insulation, as it can create what is called a ‘tight home’, increasing airborne contaminants and decreasing overall indoor air quality. If you’re looking to improve the passive heating and cooling of your home, talk to one of the HVAC experts at Tippetts Mechanical here in Las Vegas. We want to make your home comfortable for you and your family.